Good makeup brushes are expensive, aren't they? And unfortunately, one brush or brand may not suit all women. For example, ever bought an extremely expensive high end brush just to find it did not work for you? Ever purchase an inexpensive brush and had it be your favorite, yet perhaps other brushes within that same line aren’t suitable for your needs? Perhaps synthetic works for you and not natural fibers or vice versa; maybe you bought the wrong type of foundation or shadow brush, and its now an expensive paperweight. Not to mention the selection of makeup application tools can be confusing if you aren't familiar with their pros and cons. From personal experience, these are all concerns which I am very familiar with. It is due to the above that department store doesn’t necessarily equate to “best” when it comes to makeup brushes, despite what you have heard. While certain high end brands do have great tools, there are always comparable (if not exactly the same) brushes out there in a much more affordable range. Our Professional Makeup Brushes are made of exceptional quality, uncompromising materials and superior craftsmanship. All Makeup Brushes feature precision shaped brush heads, hand crafted of high-tech synthetics or luxurious natural bristles. Each Professional Makeup Brush features a long sturdy, wood handle for superior leverage and control.We only sell application brushes that would last for many, many years when cared for properly. And because we keep our prices affordable, customers can mix and match without worry to see which type works for them. Why use a profession brush for foundation application as opposed to sponges? You will get a more even flawless finish. They work well with all types of foundation, including creams, liquids and even solids. They make spot application and total coverage easy because of their unique flat, tapered shape. And sponges, while effective for coverage, soak up a ton of foundation, causing you to waste lots of money. Nylon brush specially desired for precise foundation application.this brush has been precisely constructed and tapered so that is applies foundation softly and evenly to the skin. Great for buffing and blending! 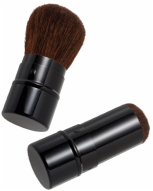 Bristles are specially designed with goat hair and synthetic fibers to give you the perfect lightweight application. Great for blending and buffing when a fuller foundation coverage is required, and also offering excellent powder pick up and coverage as well. A good powder brush is the best tool for creating a set and smooth, finished look. When you apply powder with a sponge or your hands, you not only expose your face to bacteria, but you can also get an uneven finish. A high quality powder brush helps you even out tone, correct blemishes and improve the look and feel of your skin. Our powder brushes achieve excellent coverage of face powders and bronzers. Luxurious soft bristles for a flawless powder application. Beautifully soft bristles are perfect for powder application and touchups. Then, just retract the brush and go.